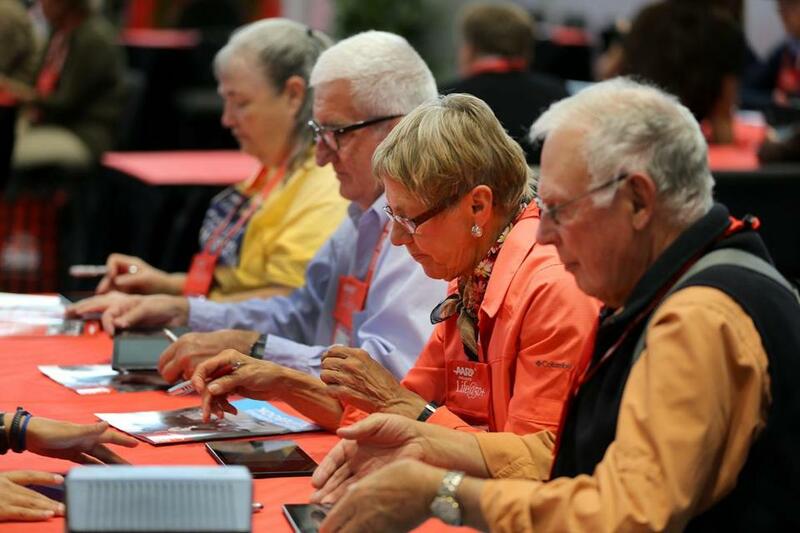 At the AARP convention in Boston this week, advisers helped participants navigate on tablets. Seated at a table loaded with mobile devices inside the Boston Convention and Exhibition Center, 70-year-old Patricia Carrington hefts a sleek tablet and points her face toward its small camera lens. And with a slight tap, Carrington enters the digital age with her first selfie. Often overlooked by technology companies, older Americans such as Carrington are getting their due from an industry that celebrates the baby-faced creators of teen-chat apps and photo-swapping websites. “There’s been a myopic focus on the young generation,” acknowledged Rob Sinclair, chief accessibility officer for tech giant Microsoft Corp.
His company, though, is joining the ranks of tech firms that are trying to better design products so they can be easily used by consumers of any age. Meanwhile, the nation’s most prominent organization for older Americans is campaigning to bring more tech to the aging masses, while pressuring the industry to pay more attention to this large — and growing — population of consumers. “We want to see the explosion of products and services that are more relevant to addressing the needs and wants of people over the age of 50,” said Jody Holtzman, the senior vice president of thought leadership for AARP Inc. So, Microsoft has provided its Xbox systems, the video console typically associated with teenagers, to a number of senior centers in New York City and Los Angeles, Sinclair said. Instead of playing “Call of Duty” or “Dance Central,” however, the older gamers are teeing up Xbox with virtual bowling games. 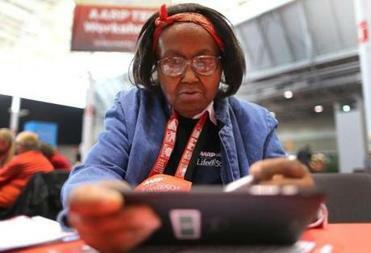 AARP held a three-day convention in Boston this week at which seniors such as Carrington toyed with the latest in mobile technology, while entrepreneurs wooed venture capitalists with new-fangled health care gadgets. Only days earlier the US Census forecasted that the population of Americans above age 65 is expected to double by 2050, to 84 million. Titled Life@50+, the AARP convention featured headliners such as Whoopi Goldberg, Jay Leno, the Moody Blues, and two Bushes — former first lady Laura Bush and her daughter Barbara Pierce Bush. But held at the edge of Boston’s Innovation District, the conference had multiple events that featured technology as a core topic. There were workshops to teach older people about hashtags, IM-ing, and friending, and pitch sessions about go-to-market strategies and target audience — all with the end game of bringing makers and consumers together. Americans 50 and older are already spending more than $7 billion annually online, according to the Neilsen Co. ratings service. Many in the age group, of course, use technology extensively already, and those at the upper end are growing more comfortable using technology in general. A recent survey from the Pew Research Center’s Internet Project found that 68 percent of American in their early 70s use the Web. “There is a group of seniors that is quite plugged in,” said Aaron Smith, senior researcher at the Pew Research Center’s Internet Project. His research found that about half of seniors online are using Facebook or other social networking sites. “The killer app for them is the ability to connect with people they care about,” said Smith, including their children, grandchildren, and of course each other. And the startup community, often seen as the province of the young making screen tools for the very young, is taking notice, too. Aging2.0 is hosting its first global summit next week in San Francisco for entrepreneurs and investors working on new products and services for older people. It is expecting about 40 startups — and there’s a waiting list to get in. A new excitement around innovation for seniors was evident at the AARP events in Boston this week. Attendees included venture capitalists from some of the nation’s top firms scouting for promising leads, and entrepreneurs such as Nicole Pardo. Her Houston company, Remind Technologies, is developing a pill dispenser that connects to a smartphone and comes with an app that reminds users to take their medication. “The senior market is huge — we don’t die young anymore,” quipped Pardo, while at an AARP event held at nearby at District Hall, a kind of clubhouse for the Seaport area that’s usually full of eager young tech types. Still within the startup community, entrepreneurs focused solely on new technology for older Americans are still in the minority. “We are the outsiders,” said Naama Stauber, cofounder of Compact Cath, which has designed a new kind of portable catheter. Compact Cath is based in Palo Alto, Calif., the heart of a hyper world of software developers trying to create the next Instagram or WhatsApp. Michael B. Farrell can be reached at michael.farrell@globe.com. Follow him on Twitter @GlobeMBFarrell.